Understanding the links between genetic, epigenetic and non-genetic factors throughout the lifespan and across generations and their role in disease susceptibility and disease progression offer entirely new avenues and solutions to major problems in our society. To overcome the numerous challenges, we have come up with nine major conclusions to set the vision for future policies and research agendas at the European level. The Human Genome Project was completed in 2003 and led to the identification of all human genes. However, the fundamental question that remains unanswered is how do genes function and how are they regulated? Epigenetics may provide many crucial answers. Epigenetics encompasses all processes that lead to heritable changes in gene expression as cells divide, while epigenomics refers to analysis of epigenetic changes across the whole genome in a cell or entire organism [1, 2]. Typically, in a multi-cellular organism, each cell type will be characterised by the same genome, along with as many epigenomes as there are distinct cell types. Epigenetics combined with genetics is a rapidly growing field with promising implications for health and disease because many common diseases result from the interplay between the genetic make-up of individuals and the environmental factors to which they are exposed . Currently, however, there is limited knowledge on the combined role of genetic and non-genetic factors thus hampering personalised medicine. A conceptual goal is to identify a cascade of genetic/epigenetic factors that underlie the development of chronic diseases. For example, a number of candidate genes have been associated with irritable bowel syndrome, but little research has examined the mechanistic impact on epigenetics . Likewise, even though environmental factors such as stress, life-style, nutrition, air pollution and infections lead to allergies, the genetic and epigenetic contributions are not well understood [5, 6]. The reversible nature of epigenetic changes has attracted interest in exploring their potential as targets for the development of novel and more individualised medical treatments. Europe, with additional effort from Member States, is showing leadership in the field of epigenetics and epigenomics and more than €200 Million were invested in research projects and infrastructure through Framework Programmes 6 and 7 (Table 1). For example, the BLUEPRINT project is focusing on distinct types of haematopoietic cells from healthy individuals and their malignant leukaemic counterparts with the aim of generating at least 100 reference epigenomes and studying them to advance and exploit knowledge of the underlying biological processes and mechanisms in health and disease . With this aim, the European Commission's Directorate General for Research and Innovation (DG RTD) and Cooperation in Science and Technology (COST) organised a joint strategic workshop “Relationship between genome and epigenome”. The workshop addressed the links between genetic, epigenetic and non-genetic factors throughout the lifespan and across generations, their role in health and disease including disease susceptibility and progression, and the associated challenges of data handling/storage and interpretation. The outcomes of the workshop will inform future research priorities and are summarised in Figure 1. Understanding the relationship between genome and epigenome and their role in health and disease enables the development of tools for personalized medicine including risk prediction, disease prevention and treatment. The EU funding provides a platform, enables collaborative work and facilitates to achieve the set aims in order to consolidate Europe's leadership position in Epigenetics. 1) In order to identify good surrogate epigenomic marks that would corroborate the influence of environmental exposure on the epigenome (including periconception environment, lifestyle, reproductive factors, microbiome etc.) and allow for the prediction and prevention of the development of chronic diseases, detailed research in humans and model organisms and careful sample acquisition (more tissue and cell specific epigenomes, time series, epigenomic variation etc.) is required. Parental conditions before, during and after conception (periconception period) may induce epigenetic changes in gametes and embryos . Such changes may adversely affect the offsprings’ future health, development, productivity and fertility . The connection between the perinatal factors and later outcomes in life was illustrated by describing the relationship between birth weight and incidence of diseases in older age such as cardiac disease . Studies of historical famines already yielded key evidence for the association of early life environmental exposure and differences in the adult epigenome . Like the field itself, these studies are in their infancy and ongoing genome-wide studies are expected to result in the identification of epigenetic alterations that are triggered by non-genetic factors leading to particular disease phenotype. The microbiome has strong parallels with the epigenome in that it is complex and may reflect environmental exposure (of the host from which the micobiome was obtained) and might also impact on how non-genetic factors lead to epigenetic changes (i.e. by modulating hormonal levels ). Accumulating data demonstrate a crucial impact of the microbiome on health and disease. 2) With the increase of chronological age, an increase of gene promoter methylation paralleled by global hypomethylation across the genome can be observed. This is remarkably similar to the DNA methylation changes seen in cancer  suggesting that similar underlying mechanisms may be involved. 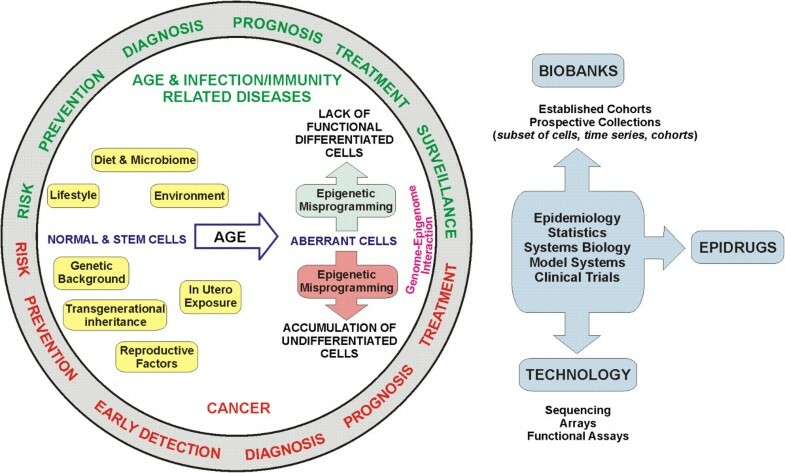 More age-stratified data are required to understand the relationship between the epigenome, the microbiome and the environment during the course of life and its impact on allergy and chronic diseases. 3) The genome-epigenome interaction is also crucially involved in the biology, character and extent of an established disease and not just in disease development. This is reflected for instance in the role that the chromatin and epigenome plays in DNA damage repair . Epigenetic markers allow for the prediction of the natural behaviour of a disease (prognostic markers) and the likelihood of responding to a specific treatment (predictive markers). Testing and validating these markers in clinical trials and benchmarking against established strategies will be crucial in order to improve disease outcome. 4) Studies of the effects and the mechanistic impact of epidrugs (drugs that can effect epigenomic modifications) and their impact on the genome, development and validation of new epigenetic drug candidates and rational design of combination therapies of genetic and epigenetic drugs should be encouraged to cure diseases or at least improve the efficacy of current treatment modalities as recently demonstrated . Structural and functional information from chromatin and DNA modifying enzymes and the development of small molecules active on specific epi-targets are crucial for the development of new therapeutic approaches. Epigenetic therapy tries to reverse such aberrations following disruption of the epigenetic signal balance through the use of both natural compounds and synthetic molecules . For instance, pharmacological inhibition of EZH2 (enhancer of zeste homolog 2, a Histone-lysine N-methyltransferase) was recently shown as a promising new tool with which to treat cancer . Many clinical trials are already ongoing, and epigenetic therapy (azacytidine) has recently been approved by the United States Food and Drug Administration (US FDA) for use in the treatment of Myelodysplastic Syndrome (MDS) and Primary Cutaneous T-cell Lymphoma (CTCL) . 5) Studies to identify functional relationships between epigenetics and genetics require analysis of ex vivo samples of primary cells, and therefore the sampling, sorting and analytical procedures need to be optimised and adapted. Cell heterogeneity (variation among cells) is a challenge in gaining a thorough understanding of genome status, gene expression and the role of underlying epigenetic mechanisms. This is true for many cellular processes, such as genome remodeling during reprogramming or the conversion of somatic cells to pluripotent cells. Therefore collecting the most appropriate samples in order to address a specific set of questions and miniaturization of technologies for the analyses of single cells [18, 19] is crucial. 6) Epigenomic and genomic data sets are complex and multi-dimensional, and their interpretation requires the further development of data analysis tools/software. A large amount of data has already been acquired and is highly multidimensional and multimodal; therefore it is the analysis that remains the challenge. DNA and chromatin exist in a 3D space. Transcriptome data are complex: all transcripts, including non-coding (nc) RNAs, overlap other transcripts and quantification is not trivial. Performing data analysis by integrating data from different repositories (some of which are difficult to find) is problematic because of the different methodologies used to acquire the data sets . There is a need to establish robust benchmarks for data analysis for the comparison of different analytical approaches/software. 7) Integrating the findings from -omics research into clinical practice is one of the major challenges of the future. Systems biology approaches are advantageous in providing predictive models of associations between epigenomic/genomic data and phenotypes offering an entry point for assays into functional relationships. Understanding the functional/mechanistic role of epigenetic marks is highly desirable, but that in many cases it may be difficult to directly obtain such insight. Systems biological approaches could identify predictive models from multi-modal data to support associations that can then be tested in functional models. 8) Improved collaborations should be fostered by the establishment and harmonization of standard operating procedures for sample processing, data acquisition and formatting; and by the development of software that is user-friendly for the non-specialist as well as facilitating an Open Access policy to allow free data sharing and automatic mining of publications. Current European effort should be aligned with those of the International Human Epigenome Consortium (http://www.ihec-epigenomes.org/) coordinating epigenome mapping and characterisation worldwide to avoid redundant research effort, to implement high data quality standards, to coordinate data storage, management and analysis and to provide free access to the epigenomes produced. 9) European Union (EU) consortia and COST Actions have tremendously shaped and consolidated Europe’s leadership position in Epigenetics and can provide indispensable means for young researchers to become principal investigators and future European leaders by integrating them into networks of experienced scientists/clinicians. EC funding schemes should devote further effort to principal investigators career development. The European Union is currently funding over 300 epigenetics projects (a High Impact Project, Collaborative Projects, Networks of Excellence, ERC (European Research Council) Starting Grants, ERC Advanced Grants, Marie Curie Actions) with a total contribution of more than €200 Million. All authors, GA, LA, BA, NA, DB, NB, CB, EB-R, JB, SB, BB-deP, MB, LC, AC, XE, AF, NG, IG, BTH, SH, JH-D, II, JI, RK, SK-E, PL, SL, AL, GM, EM, GM, NM, EM, CM, KM, MM-V, GM, DN, BN, MN, JN, SO,MP, RP, UP, MR, JR, MR, MDR, BR, SS, DS, ES, TS, HGS, ET, M-ET-P, RT, AVS, MV and MW, contributed to this report equally as members of the workshop. All authors read and approved the final manuscript.